Bangalore, Karnataka, India: The Roadster Life Co., the largest casual wear brand on Myntra, has recently launched their first ever sustainable jeanswear collection with over 50 options to choose from – the largest collection of sustainable jean-wear launched yet. As a brand that represents the adventurous life on the road , this jeans-wear collection stems from their core thought of working towards a greener environment. With this new collection, priced at an economical MRP of Rs. 2,199, they have begun their green journey by increasing their focus on using more sustainable ﬁnishing processes and using eco-friendlier and recycled materials across their collections to lower the impact on environment. The pricing strategy stems from the brand’s thought that making a difference to the environment should not come at a large cost. Designed to impress, the collection is not only eco-friendly but sticks to Roadster’s rugged style yet keeping it simple. Fit and styles take center stage, with a particular emphasis on silhouettes: straight-leg, ripped, distressed and clean-cut designs that are sure to please fashion seekers. Jeans are typically made from non-organic, non-sustainable cotton, which means pesticides and a colossal amount of water being consumed. The latest collection is created with responsible cotton to create simple quality jeans with attention to detail and sustainability. Roadster’s approach toward green jeans is a systematic and methodical one that aims to create sustenance opportunities at every stage of the creation of the product. As a sustainable practice, it does not limit itself at the garment manufacturing stage but extends to how the product is used and into the post-consumer use stage i.e. Material & processes> garment care> recycle. The collection includes a minimum of 50% sustainable materials or processes. The collection has a good mix of 100% organic cotton jeans, Recycled poly jeans (each pair using between 9-21 bottles worth of plastic for production) and reduced water jeans (each pair saving on 36 litres of water). These practices also help reduce water consumption by 71% and uses 30% less energy which can then be reused. Environment- friendly ﬁnishing processes is another key area that to the brand has focused their endeavors on. All organic cotton used for the products are according to a strict standard and has been certiﬁed by accredited certiﬁcation bodies such as GOTS. The most novel thing that sets this collection apart from the others is the scratch to end approach towards sustainability as a concept. 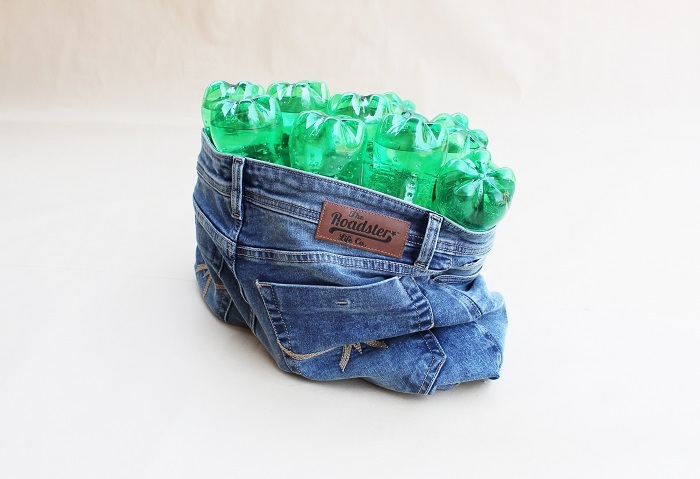 The jeans come in sustainable packaging along with Biodegradable and Recyclable materials that include - Biodegradable plastic & denim duﬄe bag and plant able shopping bag - unique shopping bags that can be torn and planted to grow plants, once it completes its life cycle. Launching the collection is a campaign titled “The Green Turn” which is a digital-led marketing campaign. Strongly product focused, the marketing assets strongly call out on the small but relevant impact made with a single purchase; to quote the campaign’s tagline, ‘taking the right turn is all that’s left’. The Roadster Life Co. is a private label from Myntra, which has grown to become a Rs. 500 Crore brand in less than 5 years; and aspiring to become a Rs.1,000 crore brand by FY 2020. It now has its focus on becoming a success in the omnichannel brand in the near future. The Roadster Life Co., the largest casual wear brand on Myntra, has recently launched their first ever sustainable jeanswear collection with over 50 options to choose from – the largest collection of sustainable jean-wear launched.